Starring: Dane DeHaan, Jason Isaacs, Mia Goth, Harry Groener, Ivo Nandi, and more. Horror and thrillers are favorite genres of mine for films and as much as I love them, they are done far too frequently where the genres get saturated with utter garbage. Do not even get me started with the genre I always refer to as “Hollywood Horror” either. Regardless of the over-saturation, some films have that rare quality to them and when they are found, they become instant favorites of mine. This film had the early capabilities to become one of those favorites when I first saw the trailer. Now I get to grace my audience with a review and ultimately the results on if my early predictions were correct, thanks to Miss Kimberly Thomas for requesting this. So here is my review on “A Cure for Wellness”! The horror film by Gore Verbinski. To most people, when they hear “horror”, an instant thought of jump scares come to mind. While that is not entirely false, the genre is not exclusive to jump scare horror, or as I like to call it, “Hollywood Horror”. The genre is split into multiple sub-categories of horror. ‘A Cure for Wellness’ is a film that falls into those sub-categories and if you were initially intrigued at one point by this movie expecting jump scares, you will be duly disappointed. ‘A Cure for Wellness’ is without a doubt a stranger-than-usual film but from my perspective, it is strange in all the right ways. Maybe classified best as a Gothic horror film, ‘A Cure for Wellness’ will keep you questioning its story to the very end. 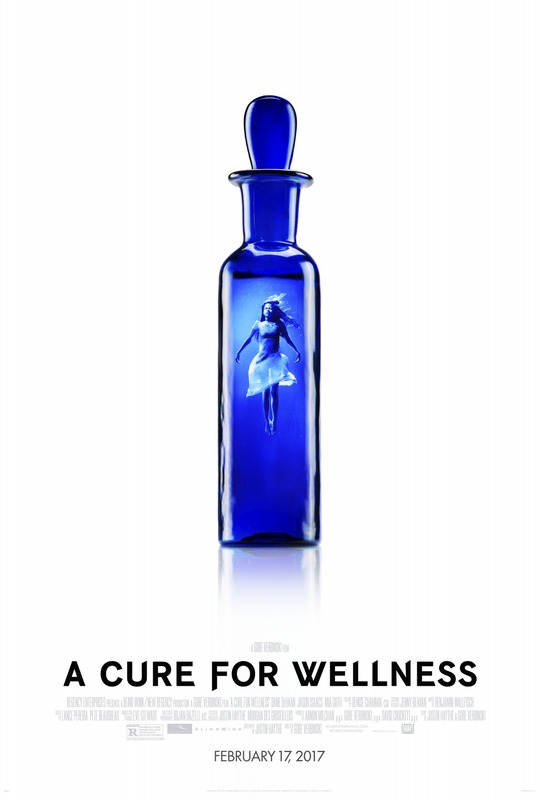 As I spoke to previously, ‘A Cure for Wellness’ is very strange. From the images it portrays, to the questionable actions of characters within the film, to the odd use of creatures or products placed throughout the film; they all combine together to make eyebrows scrunched and ultimately make its viewer wondering what the hell is happening. These certain strange and mysterious happenings work wonders to create such an uncomfortable atmosphere throughout the film. Further bolstering it as a Gothic horror film and although not necessarily being afraid by one center monster or evil element, but rather being afraid at the suspense and mystery in the film. Regardless of how well the overall atmosphere of this film was and how well the actors did at portraying their respective characters and adding to the atmosphere, one major sequence of events broke the overall positive experience I had with this film. The final fifteen or so minutes resort to what I feel is a cop-out of an excuse to everything that has happened with the film. A reasoning that has been done in a multitude of different ways in plenty other horror films and felt ill-placed within this particular film. While not entirely shattering the experience the majority of this film created for me, it surely blemished it significantly. Beyond the ending, I also feel it necessary to note that certain moments happen within the film that raise questions that are left unanswered come the film’s end. Minor petty plot-holes but significant enough to wonder why they happened. Overall, ‘A Cure for Wellness’ is a fantastically done film from a multitude of different perspectives. The images portrayed, the cinematography, the performances, the overall eerie atmosphere created, among many different elements. Surely to be considered cult-classic status, the film, from my perspective, is a refreshing and extremely well-done horror film. While having a few petty plot-holes and an ending that in my opinion did not fit well for the type of product made for what is about 90% of the film, ‘A Cure for Wellness’ is a different type of horror that prides itself on the eerie atmosphere and off-the-wall elements it presents to its audience. These elements have the possibility to make them feel as uncomfortable and curious as the main character feels while inside the film. Highly worth the watch for the fans of horror and worth the watch for the audience that enjoys mysterious films that keep you wondering til the very end. A positive Oberrating here at Oberrated. Posted in 2017 Movies, Movie Review, Oberrated Requests.Tagged A Cure for Wellness, Dane Dehaan, Gore Verbinski, Jason Isaacs, Mia Goth.